Whether it is the net effect of the president’s extraordinary brain or the result of more conventional economic and geopolitical forces, the U.S. tariff wars are set to derail global recovery that has taken a decade to materialize. Where will the current tensions lead? The progression of Trump’s tariff war can be illustrated through three scenarios, showing the development of the dispute from a mere bilateral trade conflict to a potential global trade war. Following a series of tariff threats from the Trump administration in spring, the economic stakes have been increased from $50 billion to $200 billion, and now to a threatened $500 billion of Chinese imports in America (Figure 1). Source: Data from International Trade Administration, Standard & Poor’s, Difference Group. Scenario 1: Unilateral Muddling Through. In July, this stage began when the two countries imposed 25 percent tariffs on $34 billion of the other's imports and levies on another $16 billion. With just $50 billion of goods impacted, the tariff’s economic impact would have been limited to 0.1 percent of Chinese GDP and 0.2 percent of American GDP, respectively. That’s when some of Trump’s key constituencies, such as the U.S. Chamber of Commerce and the National Farmers’ Association, began a campaign against the tariffs; they were soon joined by American retailers and a host of other industry associations. Scenario 2: ‘America First’ Escalation. Every U.S. president has exploited China-bashing in the post-Cold War presidential campaigns. However, Trump is the first to walk the talk in the White House. With escalation, the stakes quadrupled to $200 billion, and the potential collateral damage quadrupled relative to the first scenario. In China, it could shave off 0.4 percent of GDP; in the U.S., 0.8 percent of GDP. Scenario 3: Global Trade War. It is the third scenario that has hovered as a threat above the global economy ever since the 2000s, as China has been increasingly used as a scapegoat for America’s trade deficit. When the stakes of the White House’s tariff war escalate to $500 billion, the potential collateral damage will increase tenfold from the first scenario. While China’s GDP could take a hit of 1 percent, the U.S. GDP is likely to suffer a net impact of 2 percent (see Figure 1 sources). Following a surprisingly sharp upswing in 2017, both exports and imports in Asia have held up very well year-to-date, with continued double-digit growth in many economies. However, now there is heightened uncertainty about the external environment. The three pillars of global economic integration – world trade, investment and migration flows –– are now positioned to take severe hits, only a decade after the global financial crisis. Falling Trade. According to the World Trade Organization (WTO), merchandise trade volume growth was expected to reach 4.4 percent in 2018; that’s only a few percentage points below the 2017 level. But as Trump’s tariffs are escalating trade tensions, a fall in business confidence and changing investment decisions are likely to compromise the 4.4 percent outlook. A full trade war could derail trade recovery for years. Stagnating Investment. Before the global financial crisis, world investment soared to almost $2 trillion. According to the UN, global FDI flows were projected to resume growth in 2017 and surpass $1.8 trillion in 2018. In reality, they fell to $1.5 trillion last year; that’s 15 percent below the pre-crisis peak. In the near term, Trump’s trade war and the Fed’s interest rate hikes seem set to undermine world investment prospects. Migration Crises. After the terrorist attacks in 2001, the subsequent U.S.-led wars in Afghanistan and Iraq, and conflicts elsewhere in the Middle East and Africa, more than 68 million people have been driven from their homes. That translates to the greatest global forced displacement since 1945. In the Trump era, a tariff war and the historical reversal of American immigration policy are likely to aggravate geopolitical friction new migration crises, and terrorism. 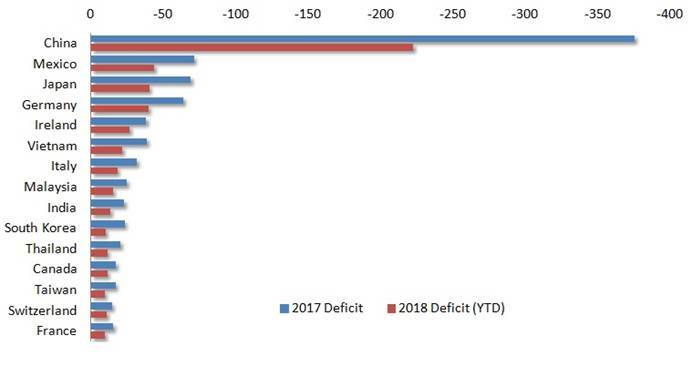 In 2017-18, the U.S. had major trade deficits with China, Mexico, Japan and Germany, as well as more minor deficits with a number of other countries. In addition to the European Union, these economies represent America’s NAFTA partners, U.S. geopolitical allies in East Asia (Japan and South Korea) and low-cost emerging Asia (Figure 2). If President Trump keeps his pledge to challenge these major “deficit offenders” along with China, trade wars will spread multilaterally. Source: Data from U.S. Census Bureau, Difference Group. Scenario 1: Pragmatism Prevails. Both parties formulate a mutually acceptable retreat from their initial positions. Since both economies are not hugely dependent on external demand, and effective tariff schedules could be delayed or diluted, a joint retreat with mutual face-saving measures is still possible, though not probable. In this case, global supply chains would remain largely in place. Investor and business confidence would return. Economic outlook would be upgraded. Scenario 2: Agreeing to Disagree. Both sides reaffirm the existing venues of economic and strategic dialogue and begin vital talks about bilateral schisms, such as intellectual property rights, technology transfer, investment review and market access, and strategic M&As. In this and the following scenario, regional supply chains would be reconfigured. Economic certainty would be restored, except for periodic market volatility. Global prospects would suffer a dip, but improve over time. Scenario 3: Balancing Trade, Kind Of. In this opportunistic scenario, China pledges to absorb substantial amounts of U.S. imports by slowing deleveraging, defers its economic rebalancing and supports importers in a big way. The trade balance would look better and the bilateral deficit would shrink, but a sustained trade balance would take longer to achieve. Scenario 4: Warring for Global Trade. Both sides dig in for the long term. The bilateral battle spreads to other regions and global supply chains are disrupted. A U.S.-Sino trade war would trigger a slowdown in Asia, which would precipitate severely impaired prospects across several regions. The outlook for global growth would be significantly downgraded. In the absence of policy changes, scenarios 1-2 seem currently unlikely (though more probable after the midterm elections.) Scenario 3 has suffered a premature death, thanks to Trump's inclination to kill the prospect of daytime talks with nighttime tweets. If scenario 4 triumphs, protectionist trade policies will dramatically aggravate conditions internationally. Even as the recent rate hike is boosting the U.S. dollar and causing broad distress in emerging economies that fuel global growth prospects, the White House is navigating toward pitfalls that represent everything but a safe haven. The international community should not follow in Trump’s footprints. If it does, that will encourage new attacks against global trade, lead to new protectionist offensives against the major EU and Asian trading economies and thus virtually ensure that some kind of scenario 4 will materialize. 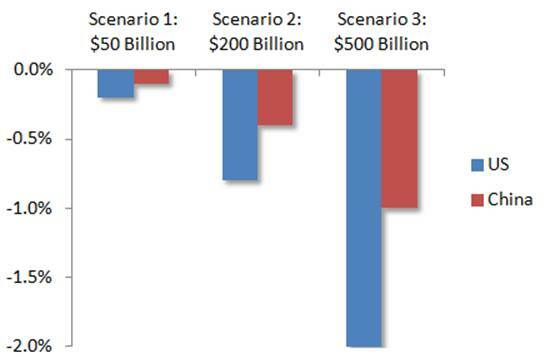 Instead, what is needed is international support for trade trajectories that will support scenarios 1-2. In the long-run, only those scenarios are in the interest of both the U.S. and Chinese economies, as well as the global economy.